In the homestretch of a presidential race where every minute shift in the economy can translate into potential votes, both campaigns took aim Friday at the Labor Department’s estimate that the jobless rate fell below 8 percent for the first time in nearly four years. President Obama’s team touted the numbers as a sign the economy is improving. Mitt Romney, along with several economists, expressed deep skepticism about the report. The Labor Department reported that the rate dipped in September from 8.1 percent to 7.8 percent. It was a glimmer of good news for Obama, who’s trying to recover from a disappointing debate performance and whose central argument is that the economy is moving in the right direction. But skeptics pointed out that not only is 7.8 percent unemployment hardly a “real recovery,” but the report reflected an uptick in part-time jobs and the number of self-employed. Further, they stressed that there appeared to be a huge disconnect between the modest number of new jobs reported and the significant decrease in the unemployment rate. 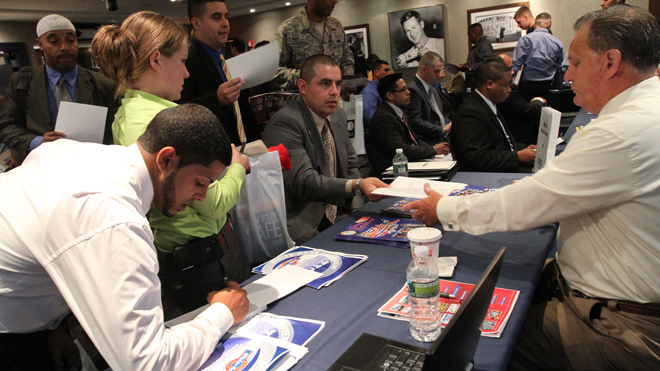 The Labor Department, based on a broad survey of employers, said 114,000 jobs were added in September. But the unemployment rate itself is based on a separate “household survey,” which showed a whopping 873,000 new jobs in September. Romney’s campaign quickly pointed out the number of people who have left the workforce has also helped keep the jobless rate down. The recovery has been tepid, but the president is trying to show that it’s at least improving. The Labor Department report showed the economy created 86,000 more jobs in July and August than first estimated. Wages rose in September and more people started looking for work. The revisions also show employers added 146,000 jobs per month from July through September, up from 67,000 in the previous three months. Still, the 2012 average of 146,000 jobs per month remains lower than last year’s average of 153,000 jobs per month. The monthly numbers are subject to change. Voters will see one final jobless report on Nov. 2, just days before the election. The increase in September was due in part to employment growth in the health care and transportation sectors. The unemployment rate fell from 8.1 percent in August, matching its level in January 2009, when Obama took office. The decline could help Obama, who is coming off a disappointing debate performance against Romney. Stock futures rose modestly after the report. Dow Jones industrial average futures, up 30 points just before the report came out, were up 45 points after it was released.